To submit a question and photos to Greenhouse Questions from our Readers fill-out the POST A QUESTION form on the Contact Us page. Or – if you prefer, e-mail shane@greenhousegarden.com (be sure to enter “greenhouse question submission” in the SUBJECT line of your email). NOTE: By submitting questions and photos (if applicable) you are agreeing to allow greenhousegarden.com to use these submissions on this web site and you further waive all rights to them. There is no guarantee that your question will be posted – but most get in. There is a lot to learn from each and every greenhouse experience! Your greenhouse question will likely be helpful to our other readers. Now you can ask your own greenhouse questions and add photos (we especially LOVE photos). Check back often for new questions from our readers! Read on for the answers . 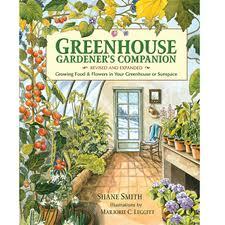 . .
Greenhouse Gardener's Companion is also available in bookstores everywhere! Decorate Your Greenhouse for the holidays? “Greenhouse Gardener’s Companion,” written by Shane Smith and published by Fulcrum, is a top selling greenhouse book for home hobbyists. It was first released in 1982 and is now in its 3rd edition. Smith has been the director (and a founder) of the Cheyenne Botanic Garden, Wyoming’s only public botanic garden. It is a volunteer-centered project (mostly seniors, youth and handicapped volunteers) with an emphasis on community and sustainability. Send us your ideas for how to improve the book Greenhouse Gardener's Companion for the next 4th edition being developed right now. Email to shane@greenhousegarden.com. While we must have advertisers to help support this extensive web site, we are not beholden to any company nor do we have any hopes to sell you on anything. Our only hope is to help you become a great greenhouse gardener! Reproduction or printing of material from this web site is strictly prohibited. A majority of the material is excerpted from the book Greenhouse Gardener’s Companion, by Shane Smith.